Depending on how widely you cast your net, Hyderabad has almost four million people. That's way up from the one million it had in 1950 and the perhaps 250,000 it had in 1865. Big enough to be in the second rank of Indian cities, it rarely figures in tourist itineraries. That may be a blessing, but it's also odd, because the city isn't just big: it has lots of character. The city is probably overlooked because India's tourist attractions were canonized in the British period, when Hyderabad was the capital of India's largest princely state. Going there was almost like going to a foreign country, in other words, and while tourists might take a peek at Jaipur and Udaipur, close to Delhi, they tended to bounce in the south from Bombay to Madras. Hyderabad fell through the cracks. 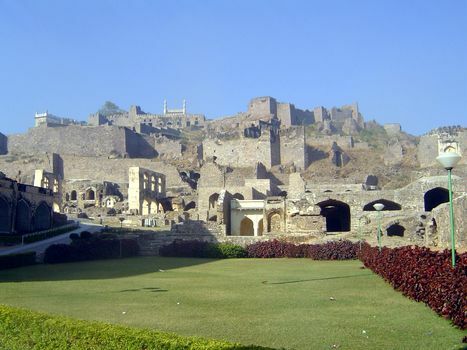 Its story begins a few miles to the west, at Golconda. The 19th century knew that name well: Jules Verne mentions it; so do Thackeray and Hugo. There are even towns in Illinois and Nevada that took the name in hopes that they would share the fabulous wealth of their namesake. The Koh-i-Noor or "mountain of light" diamond, after all, was cut in the Sultanate of Golconda. 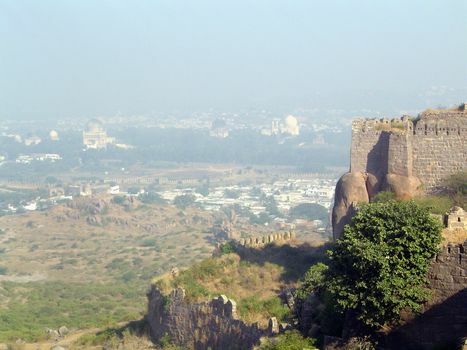 The name Golconda itself apparently means "shepherd hill" and was given back in the 12th century, when this part of India belonged to the Kakatiya kings of Warangal. 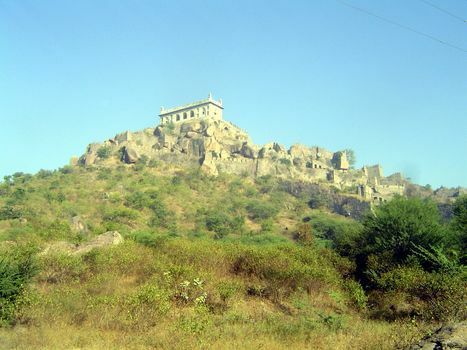 The hill passed in the 14th century to the Bahmani kings of Gulbarga and Bidar. As their regime weakened, regional lieutenants seized chunks of it and claimed independence. One of these lieutenants was a Turkoman from Persia. He proved to be the founder of the dynasty that ruled Golconda for about 170 years, until the Moghul emperor Aurangzeb captured the city with the help of a foolish traitor who, expecting a reward, was instead executed. By then, the fourth Qutb Shahi king had already established the city of Hyderabad, a few miles to the east. (It's named for Hyder, a favorite concubine.) 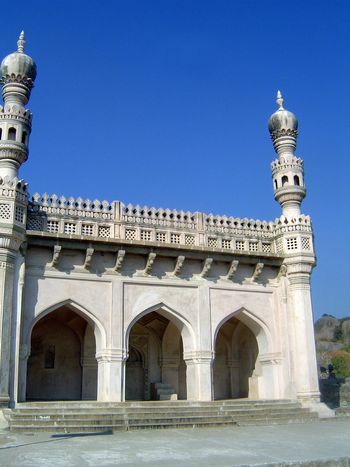 We'll get to Hyderabad soon, but in these initial chapters we look at Golconda and the Qutb Shahi tombs at its foot. 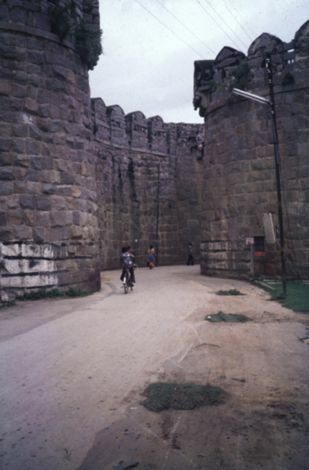 West of town, this is the Fateh Darwaza or "victory gate," one of nine originally in the 3-mile circuit of walls. This is the one that the traitor opened for Aurangzeb's troops. 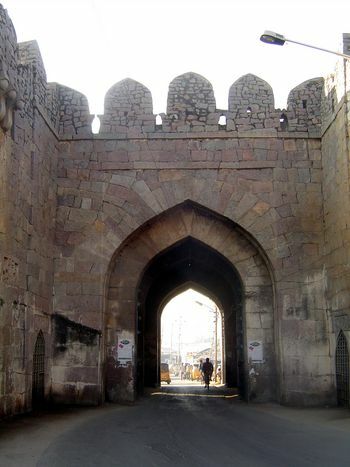 The Banjara Darwaza, too, is curved, but the curve is behind and to the right of the camera. 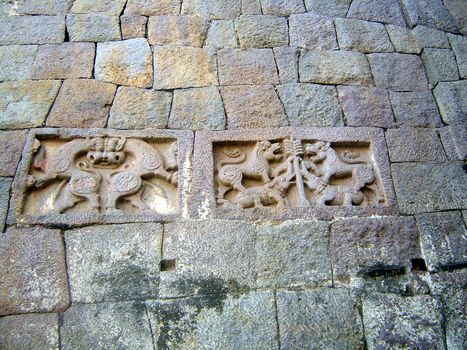 There are several icons at the Banjara Gate, including these. It's interesting because this was a Muslim city from beginning to end. So much for the truism that Muslims are rigorous iconoclasts. 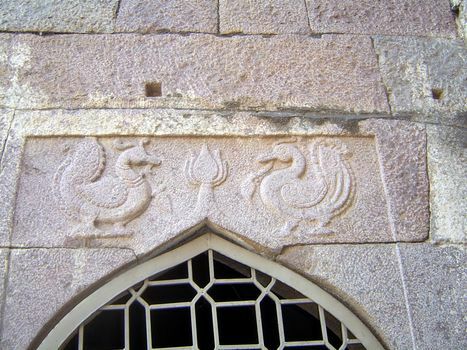 The icons may be taken instead as emblematic of the blending of cultures that characterized the history not only of Golconda but of the later Hyderabad state, where a Muslim elite ruled a Hindu majority and made some concessions to it. More icons. The local stone is granite, here quarried in massive blocks. 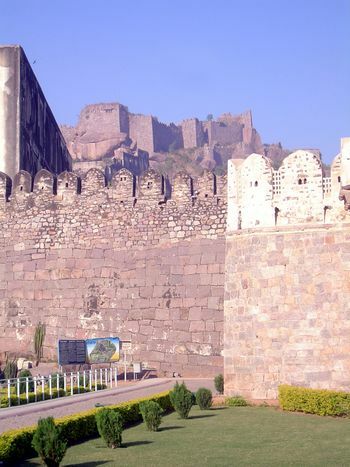 An inner wall, about a mile and a half long, surrounds the city's Bala Hissar, or fortress. Inside that gate are the ruins of what was a city. One of the most intact survivors is up top. It's variously described as a baradari--a summer palace, with plenty of ventilation--or as a durbar or assembly hall. However defined, here it is. Interior stairs go up to a rooftop terrace. 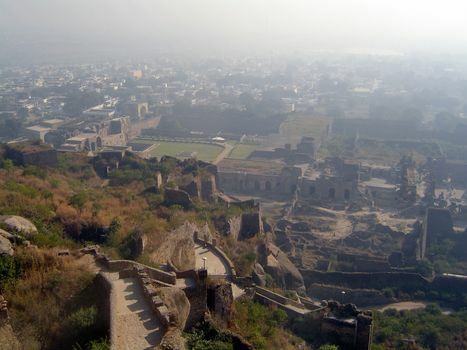 From that terrace, there's a view east over the city's ruins. The view north is toward the tombs of the Qutb Shahi kings.